Holiday dietary advice usually focuses on the amount of food eaten, and the guidance almost always pertains to the idea of “food as calories.” I’ve never been told to watch my intake of plants, nor to be cautious of all the natural medicine I may be receiving, because let’s face it: we tend to view food as a source of macronutrients only (carbs, fats, proteins). It’s easy to overlook the herbs, spices, and seasonings used in holiday dishes. Without them, however, no meal would seem complete. I’d like to showcase some of the plants that play a starring role in the modern American Thanksgiving menu, and briefly summarize their traditional usage in North America*. Now, I understand that the real story of Thanksgiving is a bit murky, and may be perceived differently depending on cultural beliefs. It is not my intention to discuss this particular issue. Rather, I am simply presenting 4 herbs that are used today in Thanksgiving meals, and linking them back to their utilization centuries ago. The first two plants are native to North America, while the remaining species were introduced from different continents. Salvia is the largest genus in the mint family, and many of its species have been used by the indigenous peoples of North America (thistle sage, gray ball sage, purple sage, lyreleaf sage, black sage, etc.). I will be focusing solely on one particular species: Salvia apiana, or white sage. 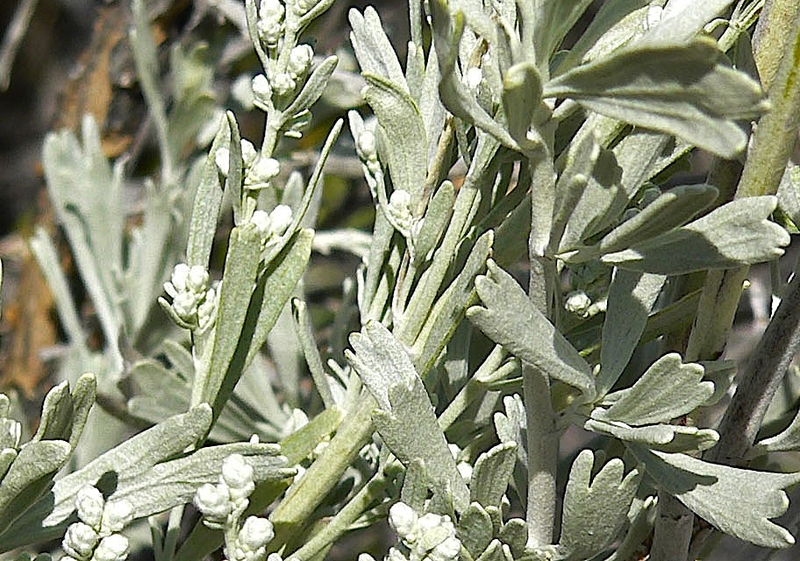 The Cahuilla, Native Americans who primarily inhabit southern California, used white sage as a cold remedy and dermatological aid, and also seasoned their food with the aromatic leaves. Like the Cahuilla, other southwestern groups, such as the Kumeyaay and Luiseño, ate the seeds dry or as a porridge, known as pinole. Today, we can receive the non-conventional benefits of white sage quite simply. For example, herbal decoctions can be brewed, and smudge sticks can be created using the plant. Its distribution is limited to the Pacific Southwest, but the conveniences of modern living have allowed cultivated sage to be readily available in supermarkets across the globe. Leaves from several different species refer to the bay leaves used in cooking, and are found growing in several continents. The species native to North America is referred to as the California bay laurel, a perennial evergreen tree found in California and southern Oregon. Several parts of the plant were used by Natives of the Pacific coast, including the Cahuilla, Karuk, Pomo, and Yuki peoples. Leaves were steeped as an infusion for stomachaches, the flesh and inner-kernel of the fruit were used as food, and branches were placed around households to repel insects. 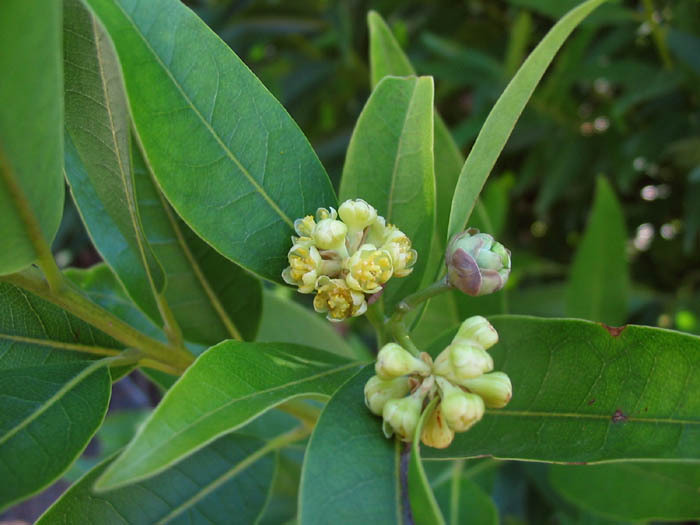 The California bay laurel contains aromatic camphor-like volatile oils, and is more potent than the commercially available European bay leaf (Laurus nobilis). If used in cooking, a smaller amount is needed to achieve the desired effect. Creeping thyme is another plant in the mint family. Unlike white sage and the California bay laurel, creeping thyme is native to Europe, and only became widespread in North America upon introduction. Still, the Delaware Natives utilized creeping thyme as a febrifuge, and would administer the plant for individuals experiencing fever or chills. What was once a cultivated ornamental has escaped to become a somewhat invasive species here in the United States. Various states and provinces throughout North America host wild thyme, as do several countries throughout the world. As many are aware, thyme makes an excellent addition to Thanksgiving fare, contributing not only flavor, but medicine as well. Wild parsley can be found scattered throughout the United States and Canada, among other areas of the world. A word of caution for foragers: poison hemlock (Conium maculatum), also in the carrot family, resembles parsley yet is highly toxic to animals and humans. That said, there are noticeable differences between the two species, and it is best to familiarize oneself with both organisms before harvesting. Of course, substituting wild herbs for the store-bought, cultivated varieties isn’t the only way to enhance the experience of Thanksgiving. One could also harvest wild turkey (Meleagris gallopavo), collect bog cranberries (Vaccinium oxycoccos), and process acorns (Quercus) into stuffing, transforming the traditional Thanksgiving celebration into the wildest holiday imagined. But don’t worry if you’re not there yet. I’m certainly not, but strive each day to reach that place. And what greater way to say “thank you” than sharing the incredible resources, given freely to us by nature, with friends and family? *Moerman, D. E. (2008) Native American Ethnobotany. London: Timber Press, Inc. In the United States, it’s easier, now more than ever, to acquire calories. What was once limited to wild pursuits has been tremendously simplified to the process of supermarket harvesting. And because of this, humans now have a steady supply of calories at their fingertips. What’s not so easy anymore is the acquisition of medicine. At first this may sound confusing, as pharmaceutical drugs are readily available from a variety of outlets. What I am referring to, however, is natural medicine. The domestication of our food, from the wilderness to the farm, correlates with a decline in phytonutrient levels. Plant phytonutrients, some of which are antioxidants and anti-microbial compounds, benefit not only the plant itself, but the consumer of the plant as well. A modern diet of cultivated foods lacks the presence of these natural medicines, and because of this, the health of the standard bitter-deficient dieter suffers. The conventional solution? Prescription drugs. After all, a medicine-deficient dieter has to make up for the loss somehow. And just what are the most commonly prescribed drugs in America (1)? Seems like we have no shortage of individuals with pain, high cholesterol, hypertension, hypothyroidism, acid reflux, bacterial infections, and to top it all off, type 2 diabetes. It also seems this is what one would expect when most of the medicine in our food is bred out, purified and patented by drug companies, and sold back to us alongside a deficient diet of domesticated food. Life wasn’t always this way, however. Native Americans were very aware of the synergy between plants and humans, and incorporated various plants into their lifestyles for not only calories, but for medicine as well. Daniel E. Moerman, a Native American ethnobotanist, compiled a book examining the plants traditionally used by indigenous cultures in America*. In a previous post, I discussed the plants, according to Moerman’s research, with the greatest number of uses in several categories, and here I will be presenting the 10 most utilized plants by Native Americans for medicinal purposes. Among 2,582 species analyzed, this is the list of plants Moerman provides, along with the number of uses amongst different cultures. Many of the plants in this list are native to North America. Some, however, were introduced in either pre- or post-Columbian times. Regardless, the Natives were able to utilize an extensive pharmacopoeia to treat a variety of ailments, and did so successfully. This is a perfect example of using food as medicine, alongside medicine as food. Today, a different picture is painted. What was once common knowledge has been lost or almost entirely forgotten. Not only do people experience sickness due to poor dietary choices, but the issue is exacerbated even more by the lack of expertise in natural treatment. The outsourcing of our food is essentially leading to the outsourcing of our medicine, ultimately resulting in a sick population that cannot take care of itself. Something needs to change, evidenced by the fact that 7 out of 10 Americans are taking at least one prescription drug, with more than half that number taking two (2). I understand the use of medicine in emergency situations, but the reasons for most of today’s prescription sales are due to poor lifestyle habits. I also understand that a single plant may not hold the cure for a disease. Cinnamon may not cure diabetes. Congestive heart failure may not resolve itself through the supplementation of hawthorn alone. But when used in conjunction with proper diet and lifestyle practices, they may certainly help. Plant medicine is not wishful thinking. Plants have been a part of our diet since the beginning of our existence, and surely serve essential functions in keeping us well. We do not get sick because we lack enough pharmaceutical drugs to keep us well. We get sick because we lack plant medicine. If you’re looking for a good place to start, the list above may help. Reward your body by incorporating more wild plants into your diet. You deserve it! After posting the article on natural flu protection, I received many requests regarding the particular immune system strategy that I practice. The three plants I discussed previously (dandelion, black currant, and ginseng) all contain compounds that support a healthy immune system, and while I do incorporate them into my herbal program on occasion, there are a few other powerful organisms that I ingest on a daily basis. Chaga is a fungus that grows on birch trees in the cooler circumpolar areas of the Northern Hemisphere. Traditionally it has been used as an herbal adaptogen in Siberian and Asian medicine, and has recently gained popularity in North America. A few key compounds found in chaga include melanin, polysaccharides, triterpenoids, and polyphenols, all of which have been researched for their antioxidant, anti-tumor, anti-cancer, and anti-inflammatory effects (1,2). Living in the northern part of the United States, I am fortunate to have access to wild chaga. I ingest it in two forms as a staple of my herbal program: dual-extracted tincture and hot water decoction (tea). Hardly a day goes by where I do not consume chaga mushroom, for I know the value that this tonic medicine possesses. Like chaga, reishi mushroom has a long and rich history as a medicine, backed currently by a large amount of scientific research. Two notable compounds in reishi include polysaccharides and triterpenoids, both of which have been studied for their anti-tumor, antioxidant, anti-cancer, antiviral, and liver-protecting effects (3,4). Both Ganoderma tsugae and Ganoderma lucidum grow wildly in my area, although I tend to consume more of the former. Like chaga, I ingest the dual-extracted tincture and hot water decoction on a routine basis (almost daily). I understand that these medicinal mushrooms do not inhabit every ecosystem, and you may reside in an area that lacks their presence. If this is the case, do not fret, for you have a few options. 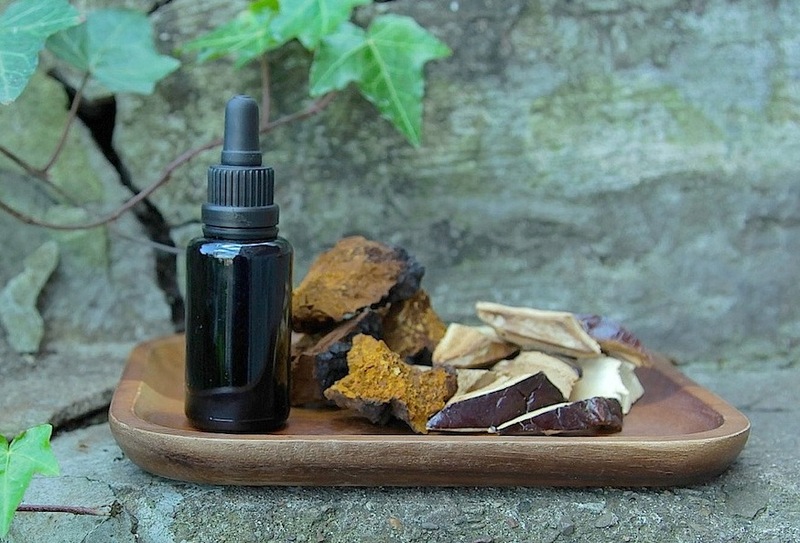 Chaga and reishi can be purchased from a high-quality supplier in many forms (dried, capsules, tinctures). 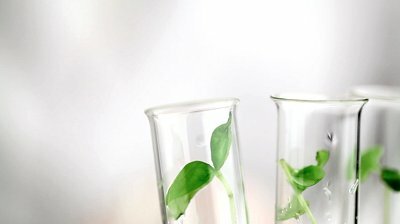 If you’d like to save money, you can harvest other immuno-supportive plants within your ecosystem. I am a believer in the theory that all the food and medicine we need grow within our local ecosystem. Wild-crafted chaga and reishi mushrooms are fundamental to my immune system strategy for two reasons: they have been used traditionally by various cultures and they are very well researched. Although my personal program is simple, it is extremely effective in keeping my body healthy. I do not wait until I feel ill before I begin treating myself. Rather, I consume herbal tonics on a daily basis to keep my immune system finely-tuned and vigilant at all times. This seems to fly in the face of conventional wisdom. The mainstream media, through advertisements and commercials, consistently promote synthetic drugs as treatment for illness. Rarely, if at all, do we hear about all the preventative ways we can keep ourselves well. Instead of food, medicine, movement, and exercise, we are pummeled with vaccines and drugs as promises for improved health. A wiser approach, however, would focus less on treatment, and more on natural prevention. Understand the importance of an immune system strategy, and view it as an insurance policy against sickness and disease. Familiarize yourself with the natural medicines that grow all around you. Work with them to strengthen your body, develop resilience against stressors, and enhance your natural immunity. What strategies do you plan to implement this season? Like what you’ve read and/or seen? Sign up below to receive notifications for new posts, and don’t forget to check out the Facebook (facebook.com/wildfoodism) and Twitter (twitter.com/wildfoodism) pages to learn more about wild food nutrition and identification! What is the best way to protect yourself against influenza? According to the CDC, yearly vaccination is the first and most important step. With so much push by the media, doctors, scientists, and health professionals to get the public vaccinated, one would think this to be the best approach. The flu vaccine is not a magic bullet. When research shows that it may have only a modest effect in reducing symptoms, another strategy is imperative. There are far superior ways to protect yourself against seasonal illnesses, ways that are a bit less toxic, non-synthetic, and free of unwanted side effects. In this post, I have uncovered 3 lesser-known natural ways to protect yourself against the flu. Dandelion: what’s not to love? It has a long history of traditional use as food and medicine, especially in Native American and Chinese cultures. Dandelion has been used medicinally as a diuretic and a mild appetite stimulant, as well as a treatment for poor digestion, liver abnormalities, and high blood pressure. Unbeknownst to some, dandelion also possesses anti-viral action, especially against influenza virus type A. Research has shown that aqueous extracts of dandelion reduce viral growth by inhibiting viral replication and infection in vitro (2). Furthermore, there appear to be no side effects associated with the prolonged use of dandelion for therapeutic purposes. Dandelion is found in all 50 states, most Canadian provinces, and in countries all over the world. A simple and effective step you can take is to harvest the plants from a clean environment and incorporate them into your dietary and medicinal programs. Sure, you can purchase dandelion extracts from a retailer, but you can save money and receive numerous auxiliary benefits by seeking them out yourself. Black currant is a deciduous shrub native to northern Europe and Asia. Like dandelion, it has a long history of traditional use both as food and medicine. Oil from its seed is popular in the supplement industry as a source of gamma-linolenic acid, a polyunsaturated fatty acid utilized as a precursor to hormones. New research has shown that an extract from the leaves of black currant possesses anti-viral activity against influenza type A virus in vivo and in vitro, primarily by preventing viral entry into cells (3). Furthermore, the extract displayed no side effects in this particular study. The researchers were so amazed that they classified the black currant leaf extract as a potential supplementary and/or replacement strategy for current anti-influenza treatments. Black currant’s action as an anti-viral agent is one more reason to include this species in your diet. Here in the United States, its distribution is more limited than dandelion’s. If you find it difficult to locate in the wild, you can purchase black currant leaf extracts from retailers. Ginseng is a perennial plant found in North America and Asia. It is extensively used in Traditional Chinese Medicine as an immunomodulator and adaptogen, and today it can be readily found in various forms (supplements, drinks, teas, etc.). While many people think of ginseng as an energizing tonic, it has also been shown to possess powerful anti-viral properties, especially against influenza type A virus. In one particular study, researchers found that mice treated 6 hours in advance with a red ginseng extract (containing ginseng polysaccharides) survived lethal treatment of influenza virus (4). Mice that were not given the red ginseng extract all died or were euthanized by day 8, and displayed more severe weight loss than the former group. This was also shown in another subtype of influenza virus, where results were similar. Because this study was done in mice, it’s difficult to say that the same results would apply in humans. But the researchers concluded that consumption of ginseng, along with its polysaccharides, would be beneficial to healthy individuals in preventing unexpected influenza infections. Ginseng grows wildly in the Northern Hemisphere, although it may be difficult to locate. Many ginseng supplements are on the market (some much better than others), providing an alternate and easier way to acquire its medicine. Ginseng, dandelion, and black currant all demonstrate potent anti-viral activity against influenza viruses. Even better, they perform their roles without any significant side effects. Remember, receiving the flu vaccine does not guarantee you anything. Many who get the vaccine, however, take no other actions to protect themselves against illness, thinking that immunity has been granted until next year’s shot. What a poor strategy. It makes intuitive sense that a robust immune system would be necessary for protection against viruses, bacteria, toxins, etc. When there is hardly a push to get the public proactive in taking care of their health through proper diet, exercise, and other good lifestyle habits, no wonder people think that prevention equals vaccination. What does a responsible adult do? A responsible adult does the research. She examines the scientific literature and decides the best course of action for her and her family. She practices an immuno-supportive lifestyle, ingesting high quality foods and natural herbal medicines from her ecosystem. Because of this proactive lifestyle, the responsible adult puts her and her family’s health first, with no influence from the mainstream media. She knows that her family’s health is stronger than it ever has been without any help from conventional medicine, and because of this, she makes the most responsible decision. My advice? Implement an immuno-protective strategy. Consume high quality foods and herbs. Practice that which supports a healthy mind and body. Do the research. Make an informed decision. Thanks for reading, and as always … happy foraging! Like what you’ve read? Sign up below to receive notifications for new posts, and don’t forget to check out the Facebook (facebook.com/wildfoodism) and Twitter (twitter.com/wildfoodism) pages to learn more about wild food nutrition and identification! The human body derives most of its energy from carbohydrates and fats (lipids). Lipid metabolism refers to the synthesis of fats, as well as the way the body converts fats into energy. It is critical that these processes run effectively, but in certain conditions this is not the case. In metabolic syndrome, for instance, fat metabolism is impaired, resulting in increased levels of circulating free fatty acids and fat accumulation. It is normal for lipids to reside in the blood (especially after a meal), but when they do not get shunted to their proper destination (liver, brain, etc. ), problems can arise. In this study, the researchers analyzed how the berries influenced fat metabolism by measuring fatty acid oxidation, or the way fats are converted to energy. They also measured mitochondrial number to determine the effect of berry samples on the energy status of cells. Mitochondria are the areas within cells responsible for energy production, and in abnormal conditions like metabolic syndrome, the number and function of mitochondria are impaired. 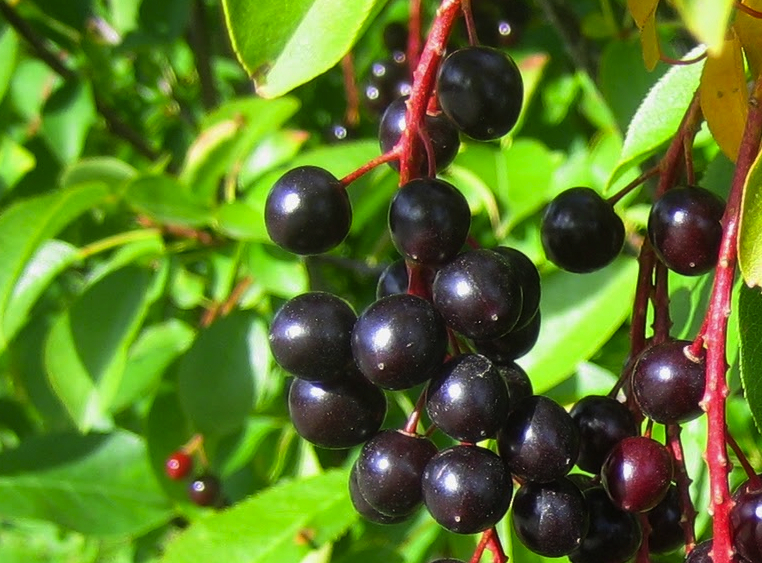 The researchers discovered that extracts from highbush cranberry, chokecherry, and silver buffaloberry displayed notable activity for enhancing lipid metabolism, while serviceberry and chokecherry increased mitochondrial number. The findings led the authors to conclude that the ability of the berry samples to modulate lipid metabolism and energy expenditure is consistent with improvements in metabolic syndrome. Quite the exciting discovery! Metabolic syndrome encompasses a host of risk factors, including high blood pressure, high blood sugar, high triglycerides, low HDL, and belly fat. According to the CDC, approximately 34% of adults 20 years and older meet criteria for metabolic syndrome, with the likelihood increasing with age (2). When there are foods associated with improvements in metabolic syndrome, it may be prudent to seek them out and incorporate them into your current diet. Sure enough, there are plenty of foods associated with improvements in metabolic syndrome. Service berry, highbush cranberry, chokecherry, and silver buffaloberry all have the ability to improve the health of those who consume them. Although this has been suggested by this particular study, keep in mind that the scientific method is only one way to seek answers. Wild berries have been consumed for millenia by the indigenous peoples of North America. The illnesses discussed in this series result from the abandonment of traditional dietary habits in exchange for the highly refined and domesticated foods of modernization. It is no surprise that we do not see the rates of degenerative diseases in Natives who follow their traditional diets anywhere near as high as the rates experienced by modern, civilized humans. It is important, now more than ever, to implement a strategy reacquainting yourself with the wild foods growing in your ecosystem. Research the distribution of these four berries, along with other edibles, and begin the sustainable practice of gathering them for your consumption. Consider them your allies in protecting yourself against the insidious diseases of affluence, and discover for yourself what it means to relay the inherent health of the Earth into your body. In the previous post, I discussed the action of certain compounds in wild berries that may offer protection against diabetes. But if the discussion stopped there, several other important roles involving phytonutrients would go unnoticed. Not only do extracts from wild berries exhibit aldose reductase inhibition (blocking the conversion of excess glucose to sorbitol), they also display anti-inflammatory effects (1). This is no surprise, as diabetes and inflammation are related, especially in the condition of obesity-associated insulin resistance (2). The researchers discovered that compounds in all 4 berries exhibited anti-inflammatory effects, specifically in reducing Interleukin-1 beta (IL-1β) and Cyclooxygenase-2 (COX-2) expression. IL-1β is a cytokine produced endogenously as a regulator of the body’s inflammatory response. It has been a target for type 2 diabetes (3) because of its association with the death of beta cells, whose job it is to store and release insulin. IL-1β, in addition to its role in diabetes, is implicated in other processes involving pain, inflammation, and autoimmune conditions. 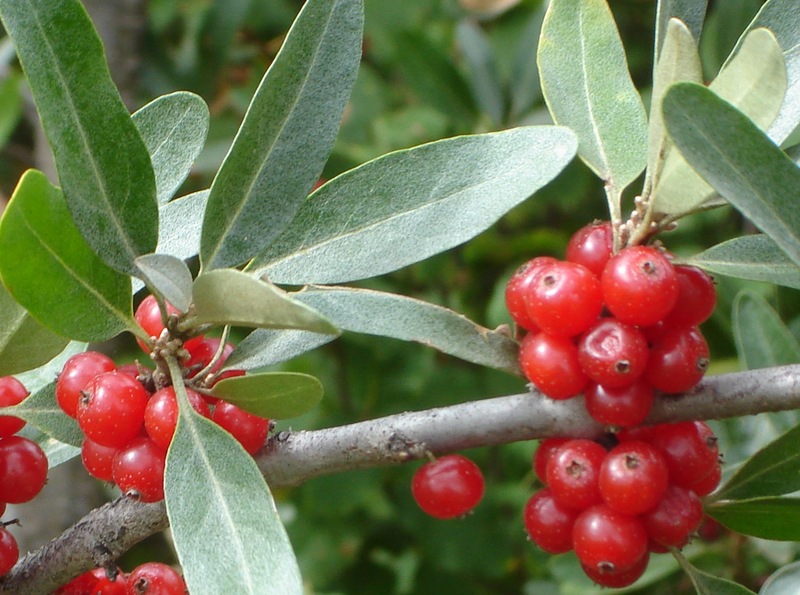 Chokecherry and silver buffaloberry demonstrated the strongest effects in reducing IL-1β. COX-2 is an enzyme involved in inflammation and is a target for NSAIDS like aspirin and ibuprofen. Normally the enzyme is unexpressed, but in the inflammation process it is activated. 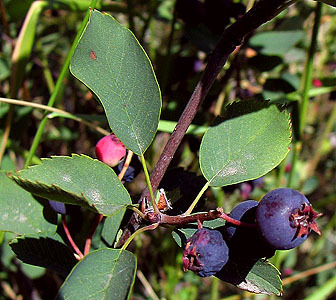 Chokecherry and silver buffaloberry, in addition to reducing IL-1β, also reduced the expression of COX-2. Not all inflammation is bad, however, as short-term acute inflammation is necessary for defense against toxins, injury, and stress. Instead, it is chronic inflammation that never gets extinguished. In this state, the body continuously produces inflammatory mediators which alter normal physiological functions. Diabetes and obesity are both associated with chronic inflammation, and reducing inflammation may protect against diabetes even in the obese (4). For this, a dietary strategy may indeed help. As seen in this research, wild berries, in particular chokecherry and silver buffaloberry, contain plant chemicals that reduce the expression of certain inflammatory compounds. Although not specifically analyzed, it’s hard to imagine that wild edible berries exhibit the same unpleasant side effects that NSAIDS may create (increased chance of heart attack, stroke, liver damage, kidney damage, headaches, etc.). Remember, in addition to the scientific evidence, we also have extensive traditional usage of berries amongst numerous groups of people. It is only within the last few centuries that these foods have fallen out of favor, and, not surprisingly, the health of the general population has declined. Stay tuned for part 3 of this series, where we will look at wild berries and fat metabolism, and put it all together.